Known for its secure and highly encrypted platform, the Telegram Messenger is one of the most powerful tools of communication. While many of us are hooked to WhatsApp and Facebook Messenger, we often tend to ignore the wonders that the Telegram Messenger contains. However, here’s a collection of some of the coolest tips and secret features of the app which will certainly make you give it a try! One of the latest introductions to the Telegram Messenger, this feature allows you to share your live location with a friend on chat. This makes it easier for the person you are chatting with to know where you are. You could share your live location for a maximum of 8 hours after which it will automatically be turned off. To share your live location on chat, simply tap on the clip icon on the right, and tap on location. There, you would get two options – ‘send your current location’ and ‘share my live location for…’. Choose the second one and share your live location with your friends and family with ease! Go to Settings, navigate to ‘privacy and security’, tap on last seen and then in the next screen, you’ll get a section called ‘Add Exceptions’ where you can select the users you never want to share your last seen information with. They’ll not get an exact timestamp but will see it as ‘recently’, ‘within a week’. ‘within a month’, etc. Unlike other applications which focus on the communication side of things, the Telegram Messenger is heavy on the security aspect of things. The app has a feature which automatically deletes your account and all your chat logs, messages, media – basically any trace of you ever having used the app disappears if you do not log in for a certain time frame. You can adjust this self destruction timer by going to settings > privacy and security > account self destructs. There you can choose the time frame as to when your account should self-destruct. Do you remember those science fiction books or movies where robots make your life easier? While we are far from that point, we have achieved quite some success when it comes to chat bots. Bot support on Telegram is one of the best features which separates the app from other similar apps. Bots on telegram can do many interesting things ranging from administering a group on your behalf to creating polls, to updating you with the latest cricket score, to introducing new stickers and much more. My personal favourite is the group butler bot which allows a user to easily control his supergroup – the admin can instruct the bot to perform pre-set actions based on a user’s behavior. Here’s a screenshot depicting what the Group Butler bot can do. What makes the app really secure is that Android users can’t take screenshots of conversations. The feature ensures that even if someone has access to your phone while Telegram Messenger is turned on, they’d not be able to take screenshots of chat unless turned off. However, to turn it off you’ll need to enter the passcode – this ensures only you can turn on or off the ability to take screenshots on the app. In order to do this, go to settings > privacy and security > passcode lock > enter your passcode. There you’d see an option called ‘allow screen capture’. Turn it on to enable screenshots, turn it off to disable them on your phone. We all have that one annoying friend who would randomly add us to groups and then before we know it our entire app would be flooded with messages and notifications. However, Telegram Messenger has a smart fix for this – you can restrict who can add you to groups. To do this, navigate to settings > privacy and security > groups. Over here, you’d see the option of ‘who can add me to group chats’. Selecting ‘My contacts’ would enable only those who you have saved as contacts on Telegram would be able to add you. You can also add exceptions to this, basically people in your contacts who can’t add you to groups by tapping on ‘never allow’ below. We all have those moments where we regret sending a message after we’ve sent it. 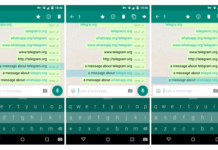 It might a typo, a misquoted figure, or maybe a confession – however, while using Telegram Messenger, you can send all the messages you want, guilt-free, as you can now edit sent messages. Simply tap on the message you’ve sent and then tap on the ‘edit’ option that pops up. However, keep in mind that edited messages appear along with a small ‘edited’ written next to them. One of the most exciting features of the Telegram Messenger, ‘Secret Chats’ allow you to have conversations which are encrypted from end to end and ensure that the conversation remains between you and the person you are talking to. Messages on secret chats cannot be forwarded. Deleting them from one chat will delete them from the other chat as well. Secret chat also allows photos, videos, messages and files to self-destruct. These self-destructive messages disappear from both phones. Also, secret chats can only be used once both users are online. This ensures maximum secrecy and once deleted they’re gone forever – not even Telegram can recover them! To start a secret chat, simply open the hamburger menu on the left and select ‘New Secret Chat’ and select the person you want to chat with. What also makes Telegram quite interesting is that the files that you get on the messenger don’t reflect in your gallery. These files can be accessed only via the telegram app and are destroyed when your account is deleted or self-destructs. In order to enable this feature, simply head over to settings and scroll till you find an option called ‘save to gallery’. Turn the toggle off and all the files that are sent to you from that moment onwards will not reflect on your gallery or ‘photos’ app but you’ll have to access them via Telegram. Another new introduction to the Telegram Messenger, users can now set profile bios – which gives other users a short introduction about who they are. This is an optional feature and can help users express themselves better. This is a cool feature that would help you interact with new members in groups in a better way. To set a profile bio, head over to settings, you’ll see that option third from the top, below your username and your phone number. Tap on bio and write a few lines about you there. The Telegram Messenger is one of the most popular tools for communication. It isn’t just another chat app, but one that keeps privacy and security as its apex priorities. There are many unique and innovative features, as you must have observed from the list. We strongly recommend you to give the app a try if you haven’t already done so! Next articleHow to Unlock The Bootloader of OnePlus 5T?